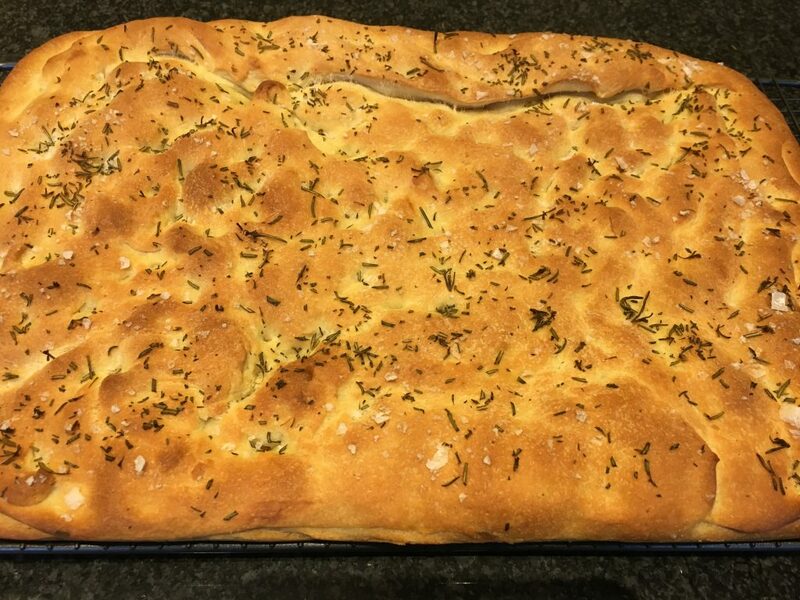 This light, airy & great for sharing Italian bread is perfect to make at home… and will be served on our new sharing platters this season too ! You will need a large mixing bowl; a measuring jug and your electric mixer with the dough hook attached – plus a rimmed baking tray measuring 30cm by 40cm (12″ by 16″). First, place the warm water, yeast & sugar in your jug, stir well and set aside for 10 mins – the mixture will become foamy. Place the the flour & salt (1 tablespoon) in the bowl of your mixer and mix for a short while on a low speed, next add the olive oil & yeast mixture and mix, again on a low speed, until the dough comes together. Turn up to a medium speed and mix for 5 mins – test the dough with your finger and if it’s too tacky, add a sprinkle of flour. Remove the dough and place on a lightly floured surface and knead by hand so that the dough comes together in a smooth ball – place this in a clean mixing bowl which is greased with 1 teaspoon of olive oil. Cover with film and set aside in a warm place for 1 to 2 hours, until the dough has doubled in size. Pour 1/4 cup of olive oil onto your baking tray and place the dough in the centre. 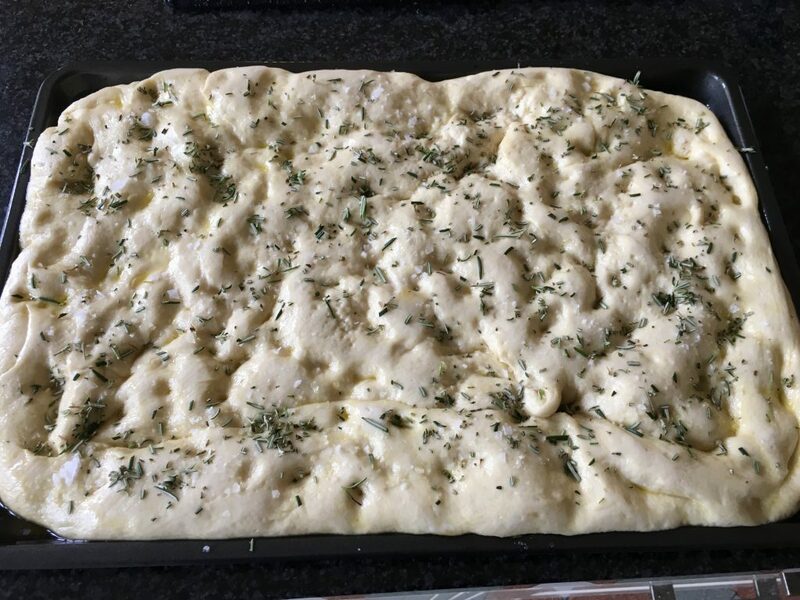 Using your fingers, press & stretch the dough until it covers the complete surface of the tray (turn it over a couple of times so that it is entirely coated in the olive oil). Then, spread your fingers and press down all over the surface to create the dimples in the dough. Cover with film and set aside in a warm place for a further hour. Heat your oven to 220 c (450 f). Remove the film from the dough and sprinkle with the remaining teaspoon of sea salt (flakes are best for this if you have them) and the chopped rosemary. Finally, drizzle a little olive oil over the top (roughly 1-2 teaspoons). Bake for 20 mins until golden, remove and place the tray on a cooling rack. 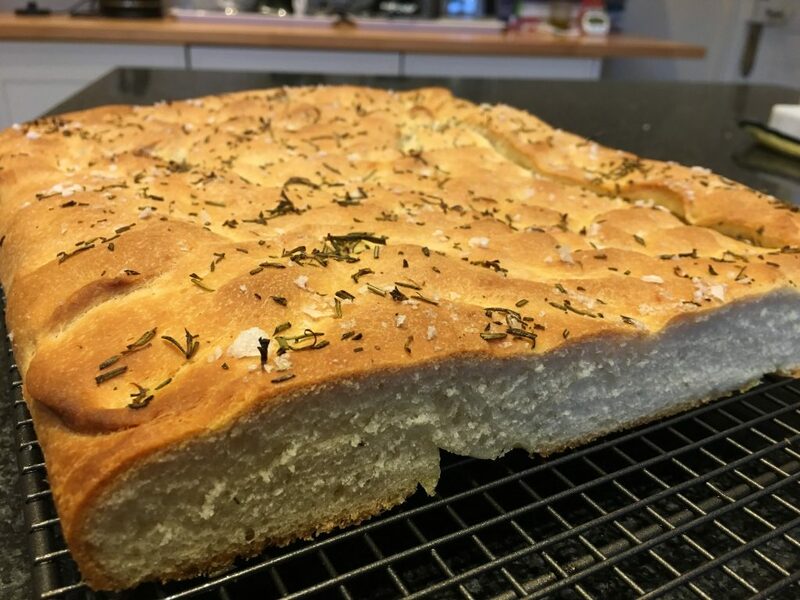 You can then remove onto a breadboard to slice & serve whilst still warm, or allow to cool completely and either cover with foil to use over the next couple of days – focaccia re-heats perfectly in a hot oven for just a few mins; or cover in film and then foil and freeze for later use. Tip – you can add other ingredients on top of the finished dough prior to baking – we are going to serve different varieties with our new sharing platters including sun-dried tomatoes, red onion, garlic, olives, parmesan & feta. Simply push your chosen ingredients into the dough before baking; with items like onion & garlic, these are best pre-cooked by softening in a pan with a little butter.